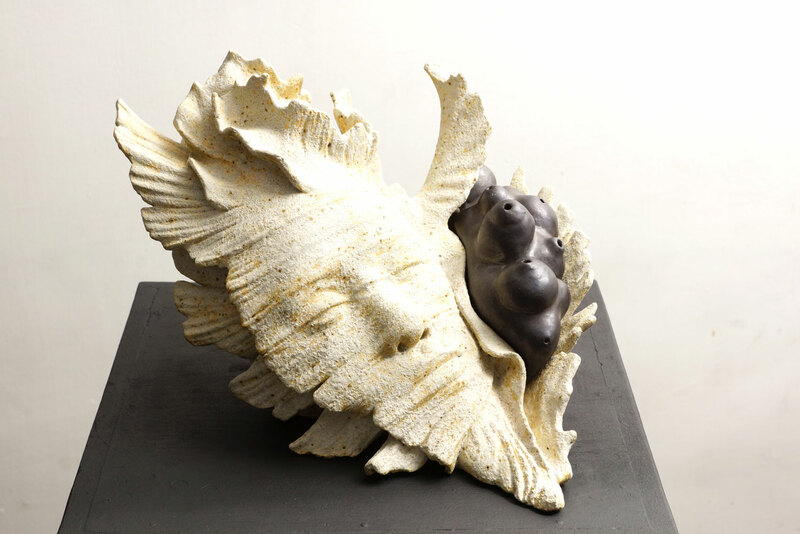 Salvador Alonday’s “Tilt Precarious” solo exhibition of stoneware sculptures opens at Tin-aw Art Gallery from April 8 to 29. Figures both graceful and dysmorphic—with contours that exude elegance, or retain a certain coarseness—that melt and contort, fragment and ossify, stage scenes that are dreamlike and fantastical. Limbs are elongated, anatomies manipulated, faces inverted, laws of scale violated. 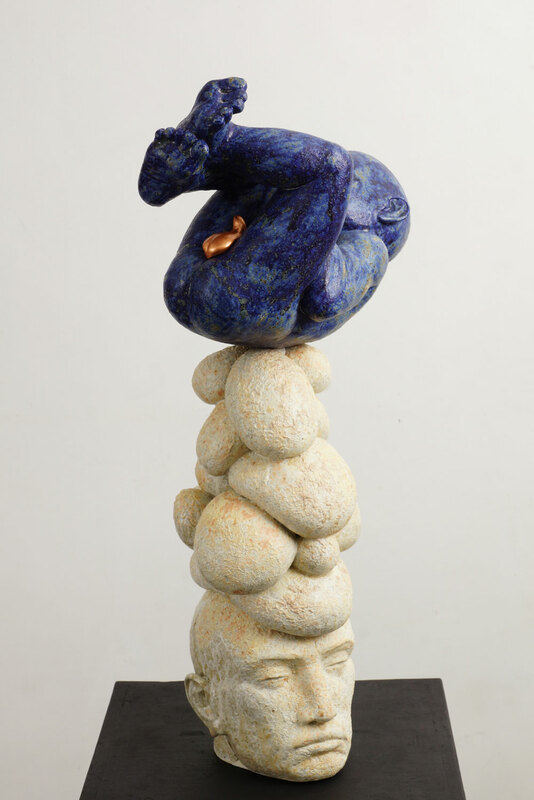 In Tilt Precarious, Salvador Joel Alonday presents such sculptures. 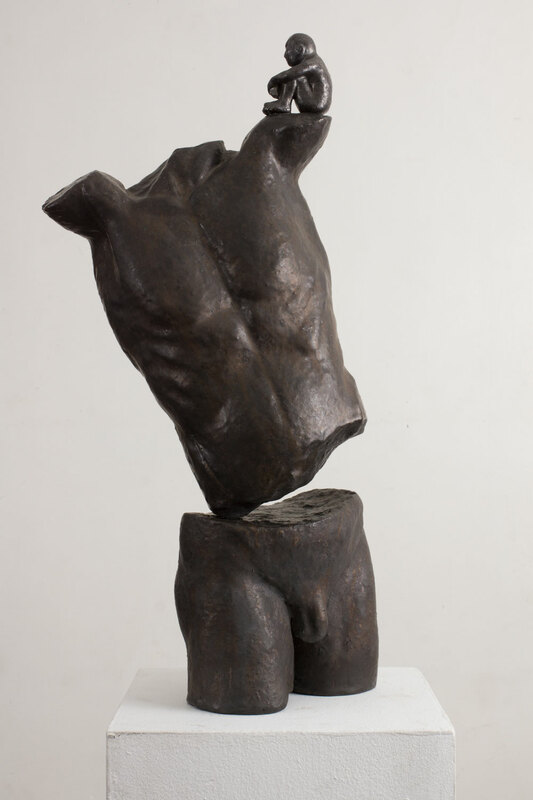 Resulting from the artist’s preferred mode of introspection and coping—an almost daily routine of entering the studio to translate ideas into three-dimensional objects—the works are highly autobiographical, reflective of his experiences growing up in a matriarchal household and his regular grappling with the emotional complexity of fatherhood. In addition to displaying an overwhelming reverence for filial bonds and a desire to uproot heteronormative conventions plaguing our collective psyche, Alonday’s lexicon of symbols and metaphors include religious and mythological motifs. 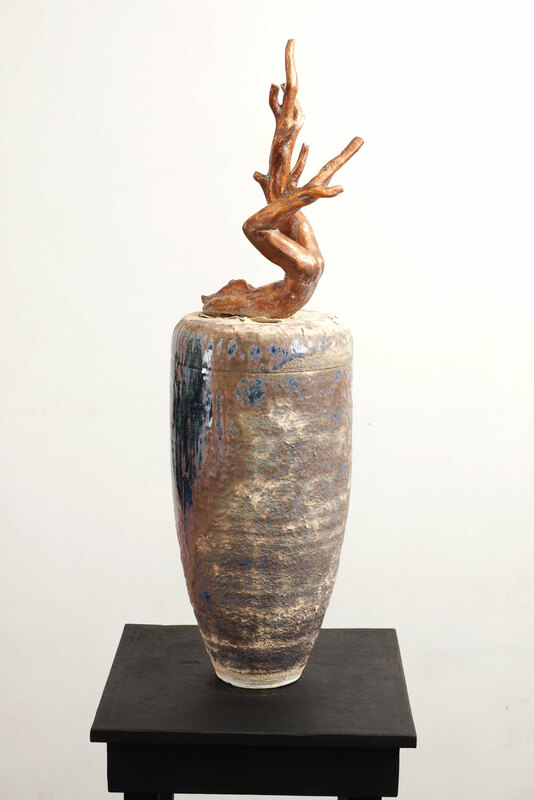 Rituals and divinities are often referenced if not directly represented: “Homily” embodies fatigue whose source the sculptor reveals in the title; “Pandora’s Jar” is a honey-vase, a womb-symbol that still contains hope for mankind; “Tilt” and “Apotheosis”, exposes young gods that are placed in precarious spots, whether on the shoulder of a broken torso or a haphazardly assembled pile of testes respectively. 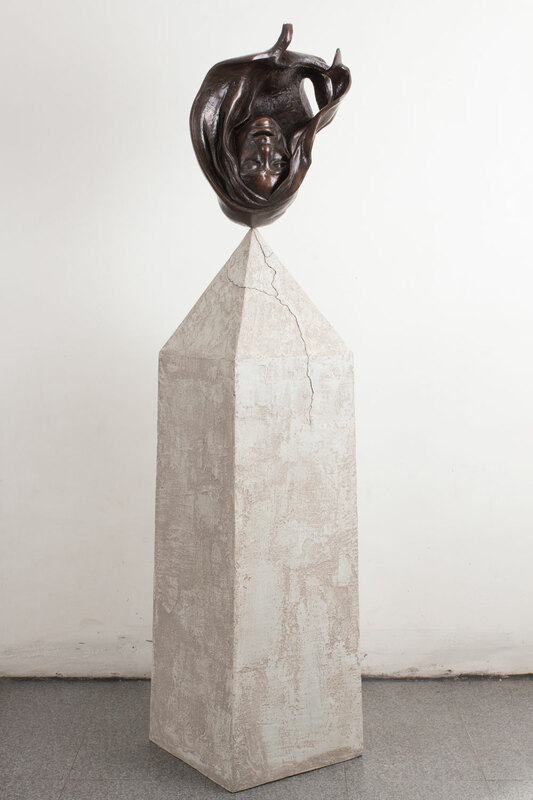 In the latter two, the artist’s desire to destabilize the fraternal status quo is readily apparent but it is most evident in the invitation piece, “So, Newton’s 3rd Law”, wherein a phallic obelisk is opposed with gravitas, nullifying its power. Exploring an alternate route, “Mammiferous Murex” depicts the potential to nurture bestowed upon a man who develops mammary glands from within his kingly shell. 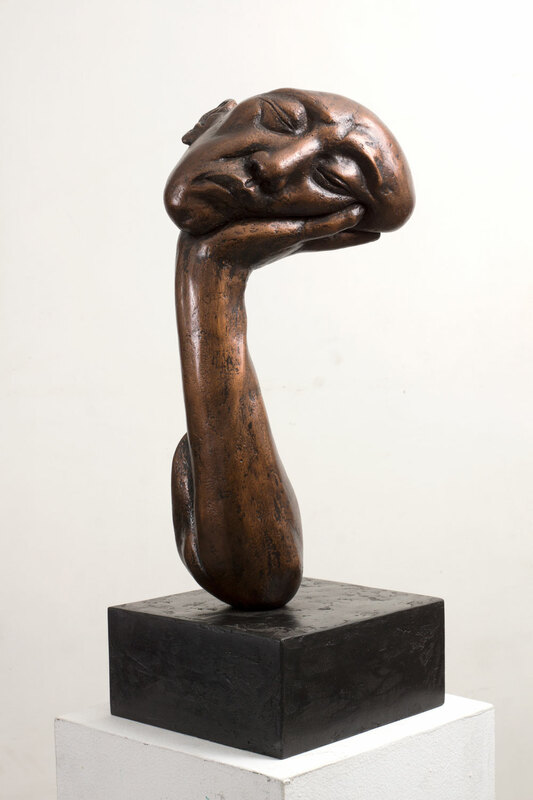 This reverence and longing for nurturing and nourishment, both as giver and receiver, suffuses some of the sculptures: “Milk” is an attempt to capture the sensation of expressing nourishment whereas “Home” explores the sadness and pride a father feels for his eldest daughter as she leaves the nest to exercise independence. At times tense, often enigmatic, Alonday’s sculptures cover a vast emotional spectrum, are poetic in spirit, and moreover, express issues pertinent to our current climate of social relations in conjunction with our individual conditions. To tilt precariously presumes a reluctant push into dangerous uncertainty; on the other side of which is the ‘pull' that hopes to restore the imperilled object to safety. The point stands at a fragile impasse between what could either be a violent end, or else, a return to peace; perhaps a transient stability. Such is the discourse of tension that Salvador Joel Alonday has crafted with “Tilt Precarious,” this collection of sculptures of no certain combination— not by period, for there are works here that date from years previous to the present; and neither by medium, for the works spell the sculptor’s flexibility with a range of earthen and polymer materials. Only that it intends to be a sort of ‘womenagerie,’ despite the presence of both the male and female form. Then too, the exhibit wishes to offer the original intent of the word ‘precarious,’ wherein a gain or an advantage could only be obtained by entreaty. It is this meaning that presents the humility and openness to risk that one decides to give at the prospect of gain. Alonday proposes this gift of returning gratitude to the feminine, where his personal history of relationships is filtered into introspections on the filial ties that bind us universally: for the mothers, sisters, daughters or the one or more women we may have had as lovers. Yet the spirit of this giving does not spring from the notion of the feminist man. It does not aim to pander generously on correcting the tilt of gender inequality. It does not claim to efface difference, but more so it is about asserting its transcendence: a surrendering to its process. In Jungian thought, the gain to be sought is individuation, a complex term that speaks of wholeness attained from the amalgamation of conscious and unconscious experience. As entreaty to the feminine, a man’s quest for wholeness involves conciliation with his inner anima, which is not a particular woman but a combination of the primordial images of woman or feminine archetypes that reside in what is called his ‘collective unconscious.’ Ideally, the unconscious finds form in consciousness, collected and disseminated as story, as myth, and even as art objects. What then of a collective consciousness defined by age-old tales of woman’s foolishness, even of betrayal or deceit? To read Alonday’s work is to revisit difference within classic lore. It invites the recognition of tension between opposites, to turn tables on a fixed meaning and release it from an ending of either redemption or blame. Hence, the tilting point: the pondering between hope and despair, between chaos and stillness. A point of transformation. god Zeus’ curse of human procreation. In this work, how a man might regard the burden and mystery of woman’s pregnancy is settled on the lid, where he sprouts his own expectation. Apotheosis could be the chapter next to Pandora’s tale, where a male head seemed to have asexually produced an infant boy on the apex of a mound of what could be testes, or what could be breasts, hinting at the vanity of patrilineal descent and familial ascent through the prized birth of a son. But the title goes to Tilt, where a boy sits in calm repose against the perilous tilt of the masculine figure splitting at the waist between realms of the sacred and the material. Teetering just as comfortably is Homily, presenting a man’s head propped by an arm in a state of rest, presumably dreaming of fatherhood. Metamorphosis resonates towards Mammiferous Murex, where a sea shell, seemingly lulled at shore, is outwardly male yet within, the actual creature grows breasts. Paradoxically, it should be the breasts sprouting the shell for its survival. Which grows what is unanswered. 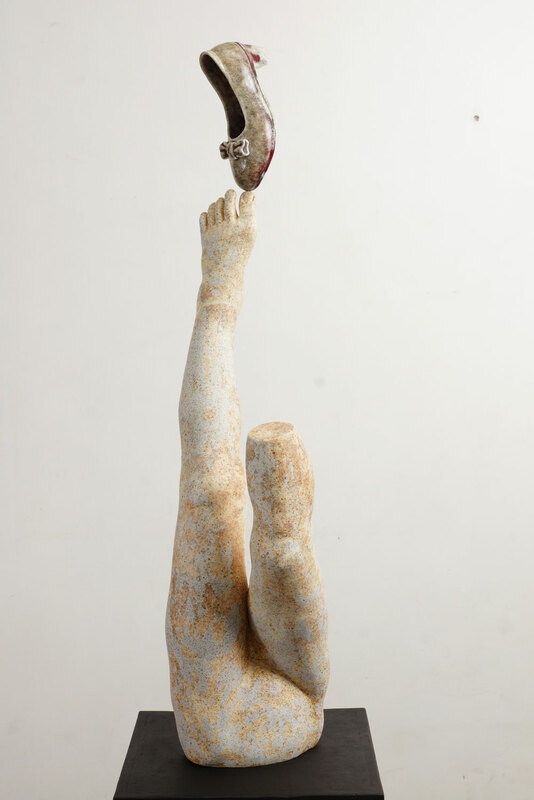 Woman at the crux of self-actualization is presented through three works dedicated to the female form. Enantiodromia evokes the law on the progress of opposites, and in Jungian sense, this applies to extreme behavior in conscious life that tends to usher in an opposite tendency from the unconscious. It is about the psyche unhinged; good could lead to bad, rest will be interrupted by wakefulness. In this case the passive feminine has been lulled towards a juncture of a yet undetermined action. Milk, on the other hand, suggests the female as one with the ‘flow,’ her body in sync with life-giving energies and with this she is equipped as nurturer. But the most empathetic piece is Home, suggesting a Dorothy at the culmination of loss or pain. One ruby slipper is perched precariously on one remaining foot, all color is drained but for the remaining stains reminiscent of blood. It speaks of finding home within, the soul secured within a fragile but enduring body. The girl survives a kind of violence or death, and she is finding her way to womanhood. In his writings, Carl G. Jung has made us aware of the tensions at play within the human psyche. Self is differentiated from ego as respective vessels of unconscious and conscious existence. Within a person's core is the self-contained ego, struggling with its autonomy to live as it is. Ego is Being, and it is its death to just remain so. In this context, Self is the Becoming, insistent on a expressing ego-consciousness into creative transformation. The operations of Self is described as violent, for it would inevitably violate the Ego’s shell, leaving wounds where spring change and growth. Just like man with his anima, and woman with her animus, opposing parts of the psyche move in circles of struggle and reconciliation. And so with X/Y, the work that serves to punctuate this collection of works, duality’s chaos takes root, and will settle its collision in due time.